Are you looking for basic storage or secure lifting technology to make oil changes, tire changes, and other services easier for your technicians? Look no further than our selection of Auto Lift™ four-post lifts. This selection includes a wide variety of vehicle lifting equipment, all engineered to improve efficiency and safety. A growing number of light-duty repair shops are expanding their business to service medium-duty or heavy-duty vehicles, so they can generate additional revenue. 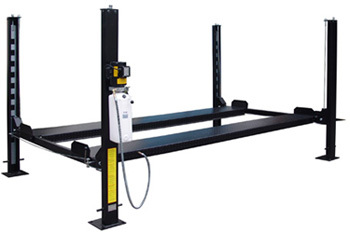 With a four-post car lift in your service bay or garage, you can streamline your services and improve customer satisfaction in the long run. Browse our selection today to find the perfect solution. Overall Width (Base to Base): 123"
Max Clearance (under track): 63-1/4"
These heavy-duty chain driven lifts are designed for many years of trouble free service. Our four post lifts are constructed with heavy gauge "C" channel. Max. 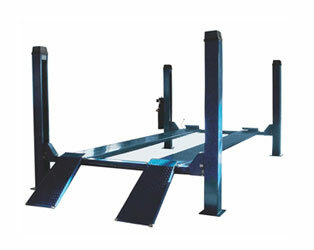 Clearance under Track: 60"
All our Auto Lift™ four-post car lifts with 8,000-pound capacities feature enclosed carriages for added safety, internal lock ladders with “auto engage” locking bars in the event of cable failure, and extra-large slider blocks for stability. Each economy model includes ten lock positions, aircraft quality cables rated at 14,500 pounds, and wide runways formed from non-skid diamond plates. Optional accessories include jack trays for holding tools and poly caster kits that automatically lift columns, so you can park two vehicles underneath your new lift to save on valuable floor space. If you are in need of a commercial-grade car lift to accommodate large vehicles, we have just the solution for you. 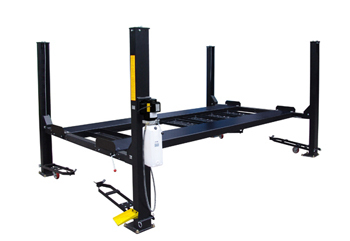 Heavy-duty Auto Lift™ four-post lifts are engineered to make vehicle storage and service easier than ever before. 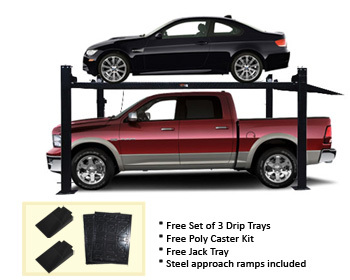 Best of all, these car lifts come equipped with jack trays, poly caster kits, and poly drip trays as standard accessories. 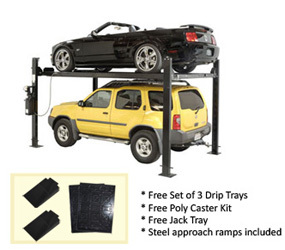 If you need more lifting power, look no further than the 12,000-pound or 14,000-pound car lift. Heavy-duty cable lifts eliminate the need for a power beam and feature a simplistic leveling locks system for use on uneven floors. Chain-driven lifts allow you to enjoy years of trouble-free service. Make the best decision for your business by exploring our Auto Lift™ collection. Many of the Auto Lift™ four-post car lifts in our inventory are eligible for interest-free financing for up to six months. You can apply for financing today with no obligation to buy. If you have any questions about Auto Lift™ products or need help finding a specific car lift for your business, please call us toll-free or email us directly for additional information.